I must admit that when we first heard about the Parrot AR. Drone late last year, it was fair to say that everyone in the office was impressed. And over the 2010 Christmas break, we all had a chance to fly this quadricopter via our iPhone, iPod Touch and iPad. Best of all, this remote control helicopter could be used both indoors and outdoors but you're probably wondering does it live up to the hype and the simple answer is yes. By tilting your iPod touch®/iPhone®/iPad™ you control the AR.Drone, and by releasing it,the Drone is instantly stabilized. Anyone can pilot the AR.Drone, it is extremely simple to use. 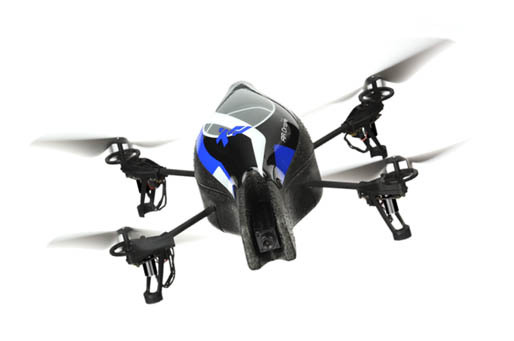 The AR.Drone autopilot allows easy take-off and landing. After take-off, autopilot stabilizes the quadricopter at 80 entimeters (2.6 ft) high. If you receive a call while flying the quadricopter, the autopilot stabilizes it and it lands after few seconds. The AR.Drone has been designed using very light and robust materials. The main structure is made of carbonfiber tubes and fiber-reinforced PA66 plastic parts. The hulls are injected with EPP (Expanded Polypropylene). Get inside the cockpit of your AR.Drone! Even meters away, keep control with your video remote thanks to a Wi-Fi connection. Two cameras are embedded, one on the front and one underneath facing the ground. Thanks to its own generated Wi-Fi network, players can create a game party where others players can join and play against each other. When you first open the box, you'll be quite surprised at how lightweight the drone is. The lightness of the product is also needed to successfully fly the device but it can also cause a problem in high winds which generally push the AR.Drone in the wrong direction and definitely could be devastating if you are too close to a tree or a house. There is however an emergency button on the app which basically forces it to land. However all in all, it's quite a cool looking device that did turn quite a few heads while we were using it outside. In order to get the Parrot AR.Drone up and flying, all we needed to do was connect the lithium battery to the body of the unit and then download the "controller" app from iTunes called "Free Flight". Once the zero cost app was installed on our iPhone 3GS, I turned on the Parrot AR.Drone and then searched for WiFi network of the unit. Once it was found, we were ready to fly this very cool technological drone that made full use of its features, including that of the control devices (iPhone, iPod Touch and iPad) and made it a joy to use. When you have paired your Apple smart device to the drone, you automatically see what the cameras are looking at and this includes both the front camera and bottom facing camera. You can mix and match between cameras which does make things interesting, especially in terms of flight control. This application even allows you to tweak the device from the sensitivity of the controls to setting degrees in relation to banking. It may be a little technical but it's worth investigating these options. Controlling the device is relatively simple but it does take a little time to master. You'll be flying in no time but to fine tune your piloting, practice does make perfect. To take to the skies, you simple push a button on your app and then you use the touch virtual thumb stick on the bottom left of the screen to move forwards or backwards and by tiling your iPhone to the side, it will make it turn in that direction. There is another option for altitude and we were thoroughly impressed at the responsive controls of the application and more particularly from your smart drive to the AR.Drone. 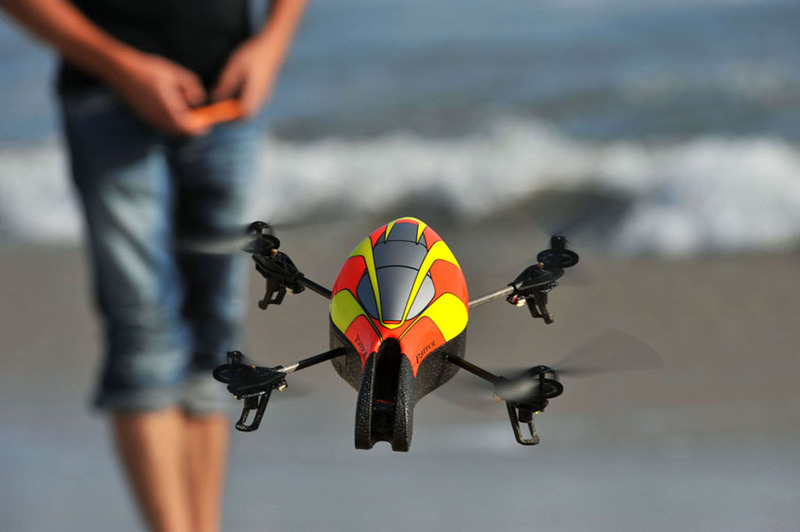 As the device uses WiFi and if you fly too high or too far away, once the connection is lost, the AR.Drone will automatically engage in its own landing process. In terms of distance, Parrot have stated that you can control the AR. Drone around 45 metres but unfortunately due to weather conditions, we could not reach this distance. The unit also has the ability to correct itself should you bank too highly which does create a sense of autopilot at times. With all the positive aspects of this review, the Parrot AR.Drone does have a few issues. Firstly, it's upper EPP (Expanded Polypropylene) body isn't the strongest material in the world. The review unit that we tested obviously had a crash before us and part of the upper body was damaged. In no way did this hamper the flight of the drone but it is a good note for those wanting to buy this that the unit is quite light and is not indestructible. Another potential issue is that the WiFi network of the drone is not encrypted and if two people had the same app, it would be a case of first in, best dressed in order to gain control. We did try to hijack the drone from our iPad while an iPhone was controlling it but fortunately once the connection is made to the initial device, it will ensure that other people cannot take over. As the four helicopter blades are constantly being used, battery life is around 30 to 60 minutes and depends on a variety of factors from winds and how much control you exert over it. Charging took over an hour. In conclusion, the future of the Parrot AR.Drone has some amazing potential. Even though the unit is a little pricey and there are some limitations, we cannot wait to see some of the augmented reality games for it as you have dog fights and fire "virtual" missiles at each other. Although if you own an iPad, it's not as fun as using it with an iPhone or iPod Touch because the iPad is just a little too large. The camera does look far superior on the iPad due to the size but in terms of control and comfortability, the smaller Apple devices are far better. Currently, the Parrot AR.Drone is available for $349 and their website contains a plethora of great additions for the device. We enjoyed reviewing this product and are eagerly awaiting the next instalment for this quadricopter. Don't believe us? Visit the website (www.parrotshopping.com) and check out the video below!